Keri Beth Kontos is a young woman, 31 years old, who is full of life. She participates in LIFESPAN’s Creative Campus’ in Troutman. Keri Beth lives with parents, Bob and Rhonda Kontos of Statesville. Keri participated in a previous LIFESPAN program that involved daily enrichment opportunities but little community involvement. She has limited verbal skills—but a huge smile that communicates all that she needs to say. LIFESPAN Arts & Gardens program offered Keri a much needed highly structured program that held her interest and challenged her to participate, fully. In the past Keri liked to move from room to room and engage for a short time in activities and then move on. Today, she has become a full participant in the classes. 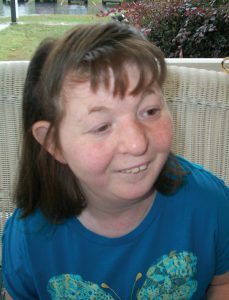 She gained confidence and loves to meet people. After classes on campus, Keri gives back to her community by participating in meaningful volunteer work at several places, including Gorden’s Hospice House in Statesville. Every Wednesday morning, Keri Beth arrives at Hospice and greets staff with goodies (cookies or candy provided by her family). Keri then goes to each patient’s room and delivers a newspaper with a smile and a nod. Keri’s new found confidence allows her to work the rooms and share her compassion and encouragement with each patient, family member and staff. began to cheer. It took a minute for the visitors to understand that they just witnessed a 31 year old woman who had just found her voice and was now an equal with her classmates. Keri Beth is now contributing to society. She confidently and enthusiastically gives of her time and talent to benefit others. She found her voice and confidence—and her abilities were illuminated. Keri’s family and staff believe that the variety of classes offered at LIFESPAN matched with community opportunities has benefited Keri with her social and interpersonal skills, and has broadened her horizons for future opportunities.